With Lent almost upon us now, here are some suggestions which Fr Goddard gave in his homily last Sunday as to how we might use this holy time of grace. · Try to get to Confession regularly during Lent. · If you are not already saying a daily Rosary then Lent would be a good time to start. If you do already, then why not take a second Rosary during Lent for the needs of others. · The Stations of the Cross is a popular devotion which focusses us on the direction Lent leads us, namely salvation won for us through Christ’s Passion and Death. o This could be personal or for others in your life. o For our children’s education and the end to immoral secular agendas being imposed in the classroom. o For the clear and unambiguous reaffirmation of Church teaching around marriage. · Lent would be a good time to make an effort in spiritual reading: You might like to consider volume 2 of Benedict XVI’s book: Jesus of Nazareth: From the Entrance into Jerusalem to the Resurrection. · Only take on things which you think you can manage for 40 days – don’t overstretch yourself. · Don’t choose something that will make you “crabby”, thus leading you and those around you into sin. · Don’t give up if you slip up in your resolve, but keep starting again for the 40 days. · If charity towards a challenging person in your life is particularly difficult, refraining from a lack of charity and trying to get on with that person can be a greater penance and mortification than, for example, chocolate or television. · Home – Consider supporting a pro-life charity, such as SPUC or The Good Counsel Network. · Abroad – Consider supporting a charity which supports persecuted Christians, such as Aid to the Church in Need. 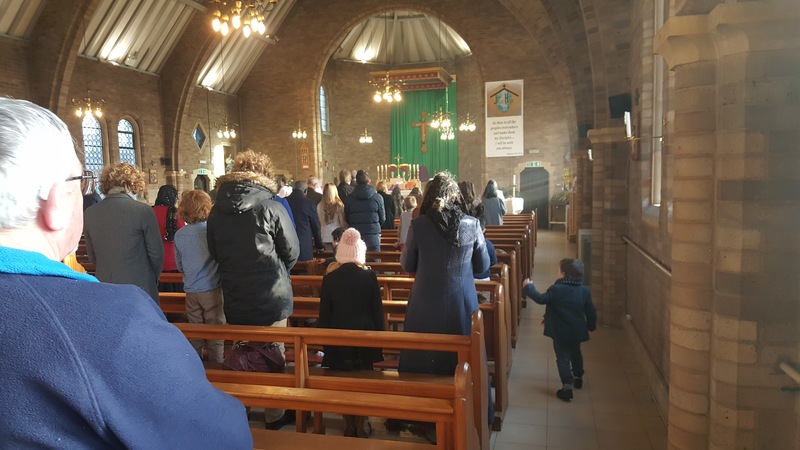 As well as the Sung Mass on 4 February described under a separate article, Saturday 3 February saw the first of five Family Catechism Days with Fatima Devotions at Christ the King. The day started with a Rosary, followed by 15 minutes of meditation, during which time Confessions were available. Mass was at 11 am, celebrated by Fr James Mawdsley, FSSP, who gave a very stirring homily on the widespread effects of abortion. Then, having refreshed souls, it was time to refresh bodies, and we had lunch. In the afternoon, Catechism was offered for the under 8s and the under 16s respectively, where the Holy Trinity was explained at a level appropriate for the participants’ ages. There were some 15 participants in each age group. It was lovely to see how much about the Faith they already knew. It was the adults’ turn after this and our talk was on the Holy Eucharist. Practice for the Sung Mass, both for singers and altar servers, rounded off a very successful day. People came and went as they were able and it was well attended by about 60 adults and children. Our grateful thanks are due to Fr Mawdsley for arranging this day and we look forward to the next one on Saturday 3 March. 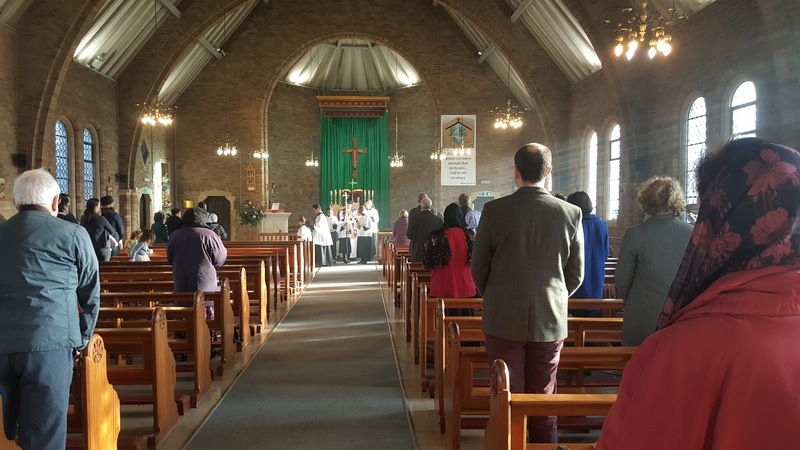 It can truly be said that a window into heaven was opened at Christ the King, Bedford, on Sexagesima Sunday, 4 February. After several rehearsals, this was the day when our own schola sang its first Mass. Although we have had two Sung Masses at Bedford previously in the last two years or so, thanks to the Bedford Choral Society, the arrival of the priests from the Priestly Fraternity of St Peter last October has given us the continuity we needed to form our own schola. Five men and four ladies gathered in the choir loft and we sang the complete Mass under the direction of Katherine Smith. No, it wasn’t perfect, but members of the congregation were kind enough to tell us that our efforts had been uplifting. We also had a team of five altar servers led by MC Nick Ross, some of them serving for the first time, and for them, like the schola, each Sung Mass will be progressively better. As our celebrant, Fr James Mawdsley, said “Heaven is surely pleased by our efforts to do what ‘all generations’ have done!”. We are looking forward to our next Sung Mass at Christ the King, which will be at 8.30 am on Sunday 4 March. We will be rehearsing in church on Saturday 17 February from 2.30 pm – approximately 4.30 pm, and at the same time on Saturday 3 March. We are always looking for more singers; please contact the Schola Secretary, Barbara Kay, on mbky3@outlook.com if you are interested. FSSP England has launched its new website today. Many hours of work have gone into creating this. Each Apostolate has its own page, including ours at Bedford! Welcome to FSSP England’s new website. While the site was born on the Commemoration of the Baptism of the Lord, it is going public today, Feast of the Presentation of Our Lord. Remembering also the Purification of Our Lady today, the Church sings the Ave Regina Caelorum at the end of Compline from tonight until Wednesday of Holy Week. Of your charity, please say a prayer for the good fruit of this website, asking Our Lady’s patronage, so that it serve the mission of her divine Son.